Beautiful Spacious Light-filled West End, Best Location, Water Views! Spacious, light, charming, two-bedroom in wonderful convenient West End location, directly across from the bay beach. Top floor of a beautiful historic building, water views from both bedrooms, approx 1150 sq. ft of space. Lovely furnishings, beautiful wood floors, equipped with great combination of original/restored charm and modern updates, all of the conveniences of home. Spacious fully equipped eat-in kitchen with stainless appliances, dishwasher, purified drinking water, nice cookware. Sunny private deck with dining table, chairs, and umbrella. Mini split air conditioning, washer/dryer in unit, flat-screen TVs in both bedrooms and living room, cable, high-speed wireless. Lovely convenient location, directly across from beach access. Near Joe's coffee, bike rental store, and antique shops. Two parking spots available from April through October. We're both writers and love the peacefulness of the apartment, AND the ability to go out into town. I fell in love with the spaciousness, the flow, the views, and the great feeling. I love the fact that the property still has an old Ptown beachy feeling, combined with comfortable updates. The light is wonderful and the location is just perfect. View more about Meryl C.
Recently renovated full bathroom with pedestal sink, tiled shower/tub. Directly across from the bay beach, with views from both bedrooms and a glimpse of the water from the kitchen too. Lovely views of the bay from both bedrooms! 2 queens beds. Water views, private deck, wireless Internet, two desks, updated kitchen and bath, air purifier, purified (reverse osmosis) drinking water, parking for 2 cars. We spent a wonderful late Fall weekend in this lovely condo. It is perfectly located on Commercial street ,but on the west end away from most of the crowds, yet close enough to walk. The condo is spacious with a full kitchen, living room and 2 comfortable beds. In the morning we had a beautiful view of the sunrise right from the bedroom. Great location. Very nice space; clean and “vintage” charming. Perfect space for two couples. I could not be more happy with this rental. Exactly what I wanted for a relaxing summer vacation: very clean, lots of light, amazing view of the water, calm, quiet, peaceful, close to the main strip near great restaurants, easy bike ride to the beach, hardwood floors, cozy but airy, spacious feel. It feels like a secluded cottage but it is actually in a prime location at the heart of it all. I would not hesitate to stay here again and highly recommend! Beautiful, comfortable and quiet space! This was an awesome place to stay! The natural light was both soothing and uplifting. It was close enough that I could get into town easily on foot. At the same time, even though it was carnival week, it was a perfect quiet place to retreat to when I needed a rest. Everything was very comfortable, from the bed to the flow of the space. I got plenty of sleep in between all my adventures. The beach is also nearby, which was a great place for a morning walk. Highly recommend! The apartment is well-appointed and well located. Definitely has a homey feel, with plenty of charming touches in its furnishings and artwork. Roomy enough so that occupants are not on top of one another, but not so big that you get lost either. Only downside is the noise from Commercial St. (there is a group rental house and a bar across the street; early morning garbage pickup), but not a problem if you are a sound sleeper. Overall, a very nice place to stay in PTown. I was dazzled by the property. 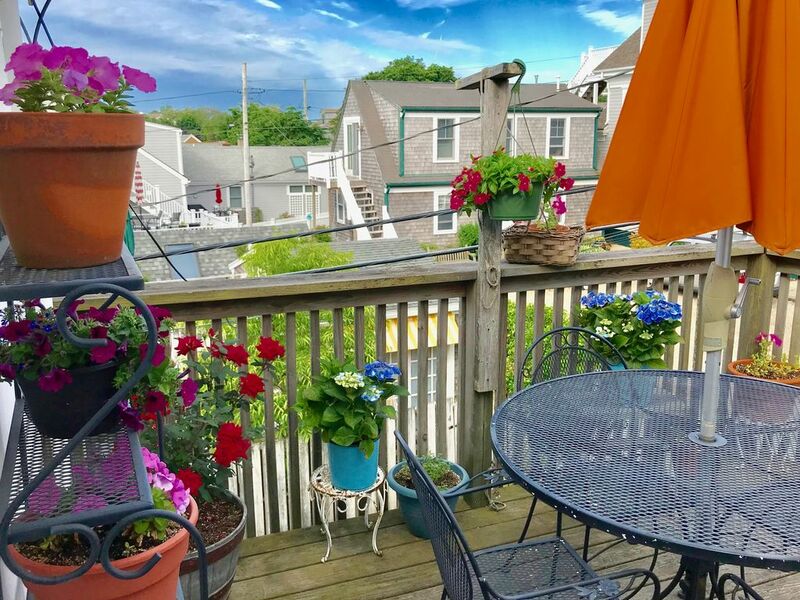 The apartment could not be more conveniently located; it's a short walking distance from great restaurants, sandwich shops and bakeries, two public access swimming pools, the bay and, a short bike ride away, the beaches. The house is both spacious and cosy. It has two large bedrooms and one bathroom. The furniture is unusual, attractive and exceedingly comfortable. The bedrooms have views of the bay, and as you reach the entrance to the apartment, there is a patio lined with plants and stunningly beautiful flowers. I had breakast al fresco almost every single day. Though the house is on the busiest street in town, it is a few blocks west of all the tourist action so it is very quiet, especially at night. Having said all the above, I have neglected to mention the most important criterion of all: energy. The property projects an energy of hospitality, joy, serenity and-- I know I'm being a tad hokey-- love. I cannot recommend this property strongly enough and hope you will enjoy it as much as I did. Ed, thanks so much for your wonderful review. We enjoyed having you as a guest and would welcome you back any time! Perfect location in the near West End, at the corner of Conant Street. Across from the entrance to the beach! Near antique stores, shopping, restaurants, bike shop, liquor store, and the bay! $235-$428.57/night. Refundable Damage Deposit of $750. Cleaning fee of $150.